Sunghee continues to work with her tutor Denise after accomplishing two personal goals: obtaining employment and citizenship. Last November, Sunghee cast a ballot in the midterm elections, her first time voting as an American citizen. It was a proud moment she had scarcely envisioned for herself six years ago when she contacted Oakland Literacy Council. 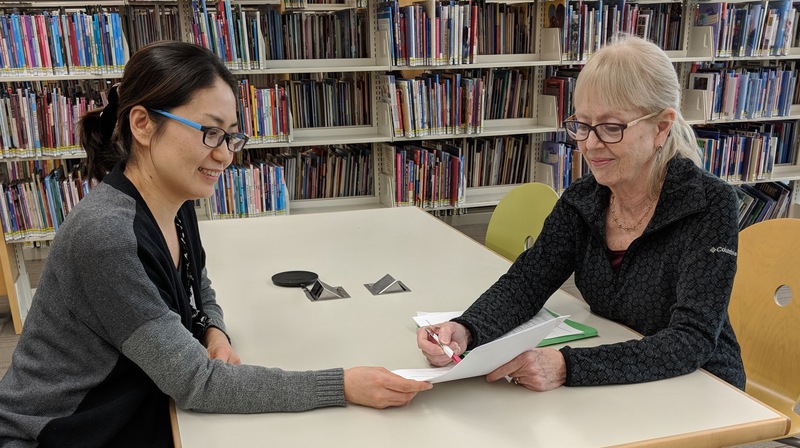 Oakland Literacy Council matched Sunghee with Denise, a trained volunteer who became Sunghee’s first American friend and helped her master her adopted language. “Denise is really wonderful,” Sunghee says. “She showed me how to survive here.” Week after week, Sunghee and Denise met at Novi Public Library. They practiced vocabulary. They read stories. They talked and talked and talked. Every week, Sunghee had homework. Sometimes, the pair met elsewhere in the community. When Sunghee wanted to learn how to manage money, Denise took her to the bank. When she wanted to pump her own gas, they went to the filling station. When parent-teacher conferences came around, they role-played a typical conversation. In 2018, she started working as a food server in the cafeteria at Novi High School. She staffs the sandwich station, where her conversation skills come in handy, especially when repeat customers ask for the “usual.” She jokes: “Whenever I see their faces, I can remember what kind of cheese and meat and whether they want a pickle.” To become a citizen, Sunghee had to pass an oral interview with an immigration official and a civics exam. To prepare, she and Denise studied the branches of government, key amendments to the Constitution, and the names of their elected representatives. Last August, Sunghee passed her interview. In September, she stood before a federal judge in Detroit and took the oath of citizenship. Eager to exercise her newly-earned right to vote, she read up on the candidates and issues. “I was excited,” she says. On Election Day, she headed to the polls with her daughters, ages 12 and 7. All three left with “I Voted” stickers affixed to their coat lapels.